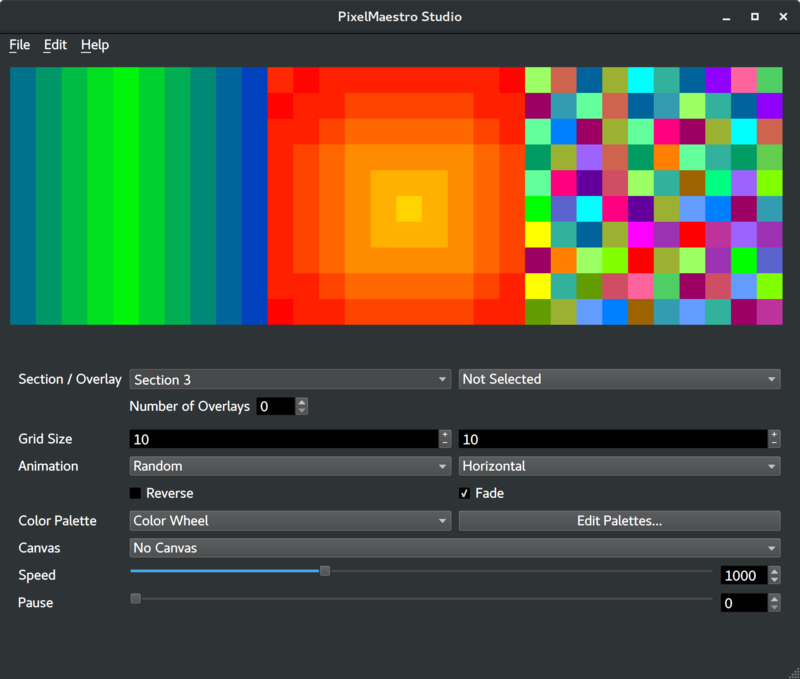 Today marks the release of PixelMaestro version 0.8! This release introduces several big changes including new features and better performance. To learn more, keep reading or visit the PixelMaestro GitHub page. 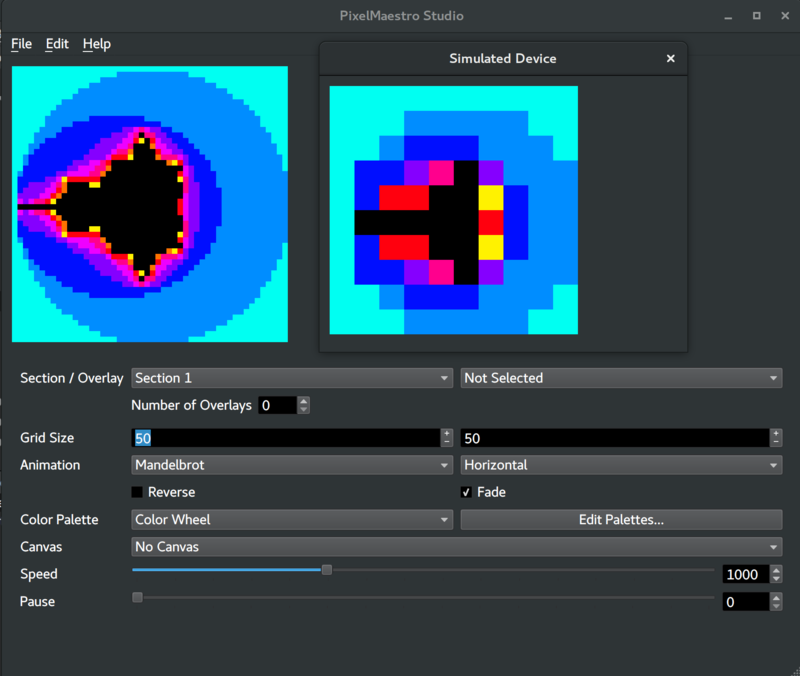 The PixelMaestro GUI is now a separate project called PixelMaestro Studio. PixelMaestro Studio is a desktop application that lets you run PixelMaestro on a PC. You can preview demos, mix your own custom animations, and control other devices running PixelMaestro over USB. 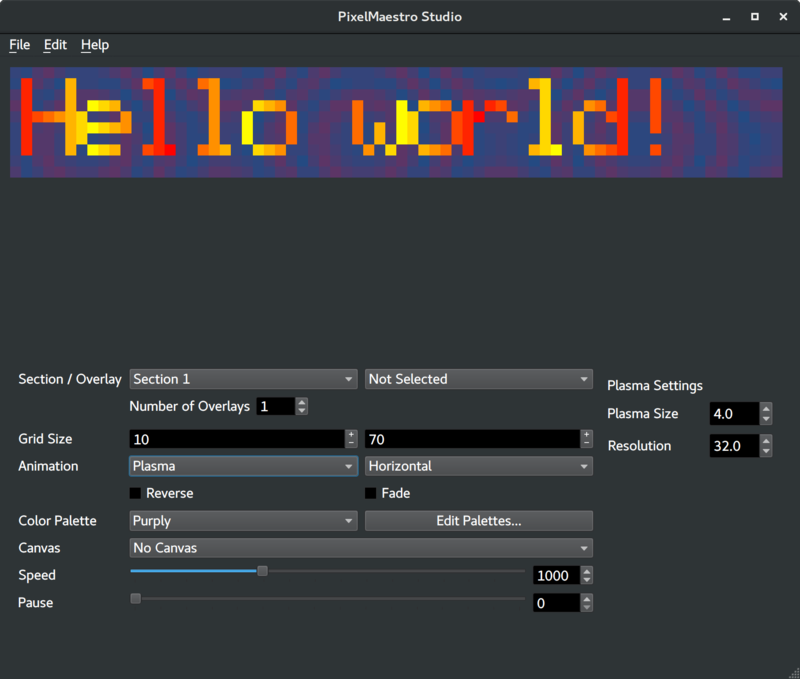 To learn more, check out the PixelMaestro Studio GitHub repository. Additional Cues have been added to support a wider range of PixelMaestro configurations. The new ShowCueHandler lets you save and share Shows and Events. Several Canvas-related Cues have been fixed, and all CueHandlers will now identify Sections and Overlays more reliably. Additionally, PixelMaestro Studio now supports saving and loading configurations to PixelMaestro Cue (.pmc) files. PMC files contain [almost] all of the data necessary to reproduce a Maestro including the number of Sections, Animations, color palettes, Overlays, and even Show Events. PMC files can be used by any device running PixelMaestro and not just PixelMaestro Studio. You can now create and edit custom color Palettes. Open the Animation Editor and click Edit Palettes to open the Palette Editor. 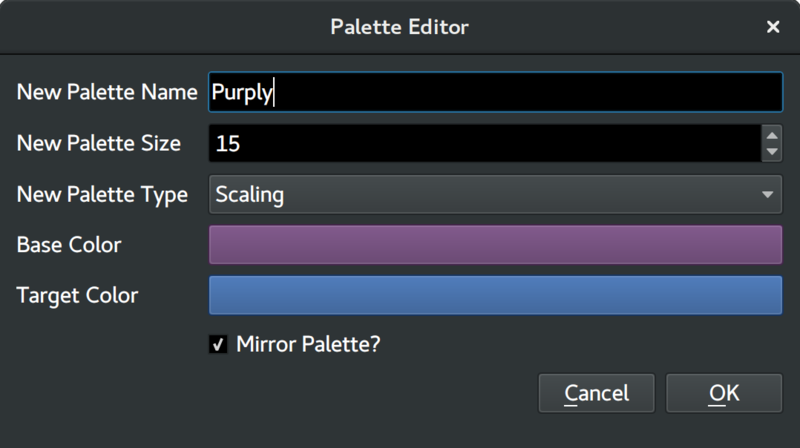 You can create, modify, and delete Palettes, and even modify individual colors in a Palette. PixelMaestro Studio now supports multiple Sections and Overlays. You can specify the number of Sections to use in the Animation Editor via the Settings menu. Each Section is rendered in order from left-to-right and is controlled fully independently of the others. The Animation Editor also supports dynamic multi-level Overlays. You can specify the number of Overlays available to each Section and the Animation Editor will automatically provision them. As with Sections, you have full independent control over each Overlay. You can now display animated images in a Canvas. Canvases can store one or more frames, each of which is an independent drawing surface. The Canvas automatically switches to and renders the next frame on each update. 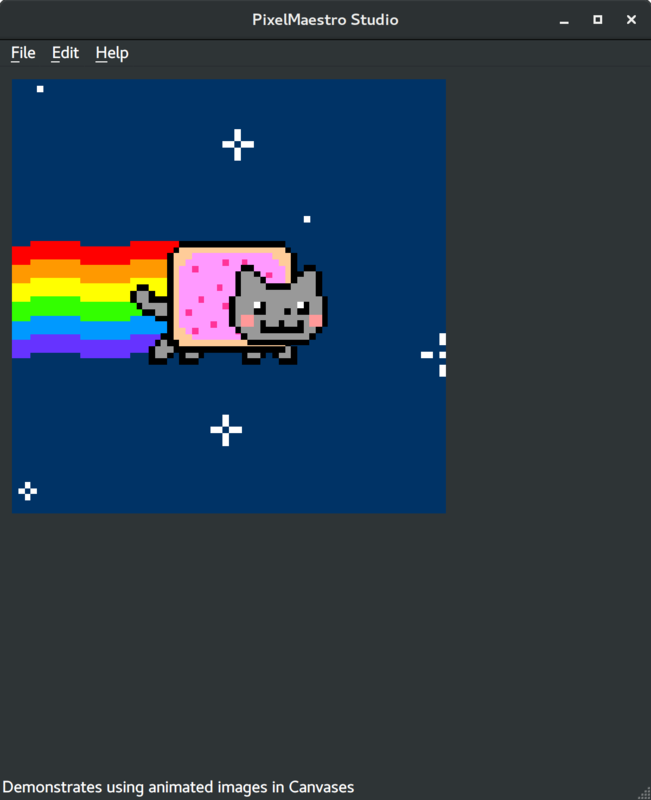 You can load images into a Canvas via the Animation Editor. This includes PNGs, JPEGs, and even animated GIFs. Images are supported in both AnimatedCanvases and ColorCanvases. This release also fixes Canvas scrolling issues introduced in the previous release. Finally, Canvases will no longer lose their contents when the Pixel grid is resized (only in the Animation Studio). PixelMaestro Studio now includes a “simulator” for testing Animations on different grid sizes. For example, you can tweak your Animation on a high-resolution grid and immediately see how it appears on a low-resolution grid. If you’re creating a Maestro with only one Section, you can bypass having to declare a Section array and simply pass the dimensions of the Section directly into the Maestro’s constructor. The Maestro takes care of allocating and assigning the new Section. Additionally, you can now bypass the Maestro’s refresh rate and force an update. This is useful in cases where you want to use your own timing method instead of the Maestro’s. Pre-defined colors and color Palettes have been moved from the Colors class to a new ColorPresets class. This was done to help organize the Colors class and reduce memory requirements. PixelMaestro now uses less CPU time thanks to a change in the way Pixels handle updates. This should make it easier to run Sections with larger (e.g. 100,000+) Pixel grids. Also, several of the PixelMaestro Studio demos have been updated to better reflect the features that they’re showcasing. Only a handful of features remain before PixelMaestro leaves alpha, mostly centered around improving stability and compatibility between components. The ultimate goal is to create software that lets you create complex multi-layered animations, but is also lightweight, easy to code for, and easy to use.